Back pain can compromise everything you do in life, from sitting to standing to lying down. 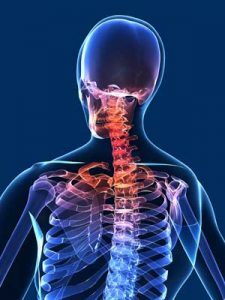 Spinal complications can prevent you from doing plenty of things you would like to accomplish, personally and professionally. Spinal disc therapy and spinal decompression are natural, non-invasive healthcare solutions that can offer incredible relief from pain. The human spine consists of a stack of 33 vertebrae, each with a disc in between. The discs are made of a thick, fibrous outer lining and a soft core which contains a gel-like substance. The discs act as shock absorbers between the vertebrae, and the discs should also be thick to create a healthy space between each vertebra and allow nerve impulses to flow freely. Many Americans suffer with disc problems, but they aren’t destined to suffer this chronic pain for life. The right kind of therapy can be incredibly effective and long-lasting. When spinal discs become inflamed or disintegrate, they will be painful and uncomfortable, making it hard to find a position, straighten up completely, or enjoy the same quality of life you once did. The spine’s role in our body cannot be understated. Unfortunately, there are a host of spinal disc or nerve problems that cause back pain and interfere with day-to-day activities. Stabbing, burning, and shooting pains are classic signs of conditions affecting the spine. Disc bulge. A disc bulge is diagnosed when a slight protrusion of a disc is apparent but has not yet herniated. The protrusion, in some cases, can apply pressure to a nerve or nerves, causing back pain. Disc herniation. A disc herniation begins as a disc bulge. There is so much pressure on the outer wall of the disc that a rupture occurs, allowing the gel-like inner core of the disc to leak into the spinal canal. This typically causes pressure on the nerve(s), causing chronic back pain. Sciatica. General compression of the sciatic nerve or irritation of one of five nerve roots that gives rise to the sciatic nerve leads to sciatica. In this condition, pain can be felt in the lower back, buttock, or various parts of the leg and foot. Spinal stenosis. When the spinal canal – the space through which the spinal cord runs – narrows, the spinal cord and sciatic nerve roots are compressed, causing back pain. Degenerative disc disease. The beginning of the breakdown of the spinal discs, degenerative disc disease often causes severe back pain. Do you suffer with severe or recurring back pain, sharp pain or numbness, or radiating symptoms down your arms or legs? These are classic signs of disc problems and should be acted on immediately to prevent herniation and surgery. Low back pain, sciatic pain, and disc herniation can develop into debilitating conditions. Specialized disc treatments and nerve repair treatments can improve these chronic problems now and in the future. Non-invasive spinal decompression could be your ticket to freedom from pain. This therapy works by gently stretching the spine at the exact location of the disc involved. Unlike spinal traction, which needlessly stretches the entire spine, spinal decompression isolates only the injured disc, making this therapy much more effective. Decompression is soft and specific to the disc level, creating negative pressure within the exact problem disc so that bulging or herniated discs can retract. There are also settings which detect if the muscles are starting to resist the decompression, allowing the force to be lowered to prevent muscles from reacting negatively to the treatment. Spinal decompression therapy takes the pressure off the nerves and other spinal structures which, in turn, allows the movement of water, oxygen, and nutrients into the discs, promoting healing, disc regeneration, and relief from discomfort. The causes of spinal disc problems can vary, and they will depend greatly on a person’s level of activity and DNA. Men, often those of middle age, are more likely to experience disc problems. Individuals who sit for long periods of time, are obese, participate in strenuous physical activity, or do a great deal of heavy lifting are more likely to develop spinal disc problems. Excessive compression forces from everyday activities can increase pressure on the spinal disc leading to spinal disc protrusion, herniation, and bulging of disc material. Spinal injuries and infections can also lead to degenerative disc disease. If you suffer from chronic or debilitating back pain, relief can be yours. Contact the Restorative Wellness Center in Ann Arbor to schedule your appointment for help with back and nerve pain. *Dennis McClure and Bethany Farris, Intervertebral Differential Dynamics Therapy – A New Direction for the Initial Treatment of Low Back Pain (European Musculoskeletal Review, 2006) p. 45-48.